The Elle France June issue features the best of summer: bikinis, makeup, haircare products, beach totes and more. Whether you’re packing for a long holiday or a weekend getaway, it’s best to be prepared for the havoc sun can wreak on skin and hair. 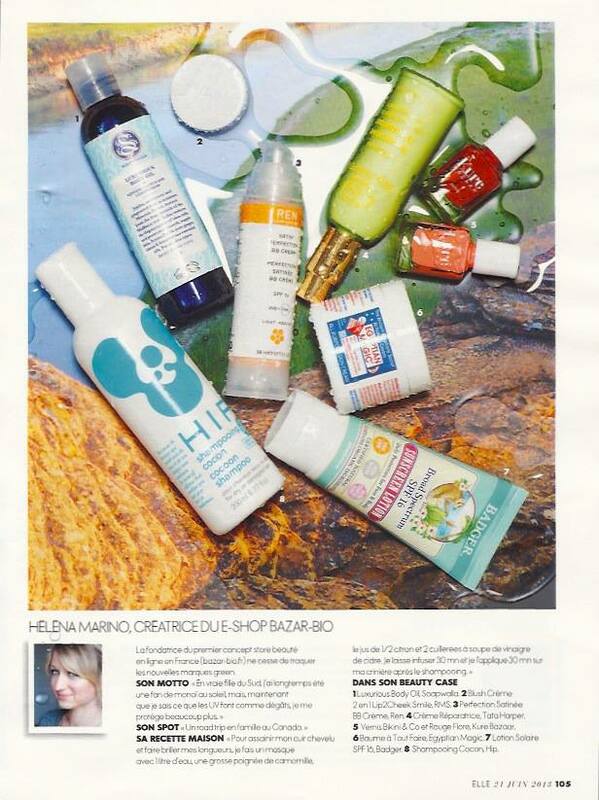 And who better to ask about summer essentials than Bazar-Bio owner Helena? With a love for natural products that are not only good for you but also luxurious, Helena’s shop was named one of France’s best cosmetics shops! A peek into her vanity reveals Soapwalla’s hydrating body oil, Kure Bazaar’s so-pretty-you-could-eat-them polishes and one of our favorites, the lip2cheek in smile. This 2-in-1 product is an absolute must for summer when you want to keep your look both minimal and fresh. Apply the creamy formula onto lips to give a pop of color and onto cheeks to fake (or enhance!) a summer flush.